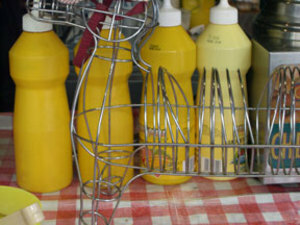 You can’t get a quicker or cheaper lunch then a hot dog. 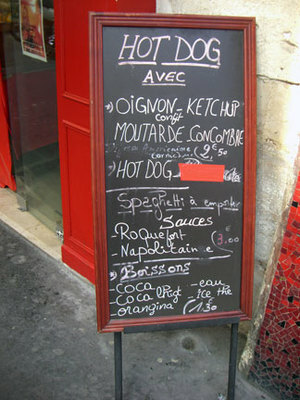 Pats’ Hot Dog is the cutest, little hole-in-the-wall serving le chien chaud smothered with onions and mustard or ketchup. At 2.50 euros, it’s the best food buy in town. 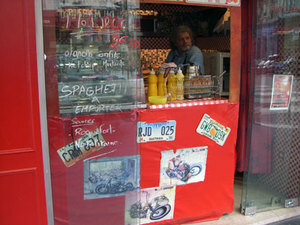 Pat also serves another American classic, spaghetti, and tops it with Neopolitan or Roquefort sauce for only 3 euros. Wash it down with a Coke or Orangina for 1.30 euros, and lunch is under 5 euros.